I bought a cheap 6309-7290 off eBay having bought a second I realised the first might be a fake. The case is very square sided unlike my other Seikos, the crown is also not telescopic like my other 6309 (it's the similar to my 7002 and skx007) The dial is 6309-113xr2 Divers 300m, which also does not ring true now I have done my home work. The lume on the hands and dial are different shades. On the positive the movement looks identical to my other 6309, now clean, stripped and regulated holds good time (+\-10 sec/day) and the jeweller that did the work did not question the movements originality. Is this a real Seiko or a feiko? Either way I will enjoy it as an everyday time piece. I'm no turtle expert but I must say that I rarely saw over polishing like on this one. 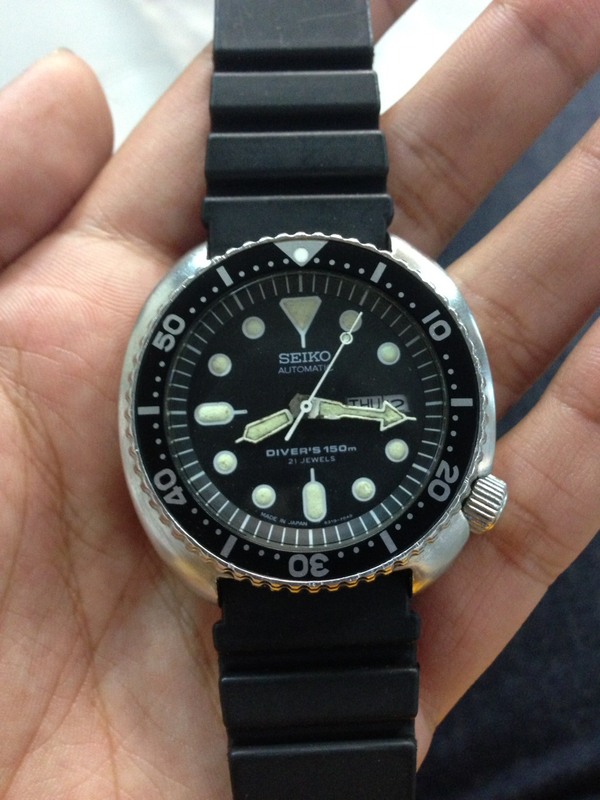 I have 6319-7040. it's a fake seiko copy of 6309-7040. Well, that's certainly no 6309-7290. The movement might be genuine, but the combination is not I don't recognize the dial design, can't imagine that's a real Seiko one. Well fella I my self have had a time of things, I was after a 7002-7000 A1, and I ended up with a franken Mod, on a plus side I didnt pay not a great deal for it, now that its been properly appraised its found to be internally correct however the dials, bezel and hands are replacements, also its near impossible to find one that's not been got at and even Seiko use after market repo dials and hands as they no longer make the originals. use your purchase as a learning curve as I have done with mine, I read that you purchased it off e-bay, contact the seller and make them aware, see if they offer to take it back? all the best fella and good hunting, "H"
Last edited by CITIZEN H; 08-07-2016 at 03:06 PM. So hard to tell. Thanks for making us aware. Really need to do your homework with so many fakes. I have exclude entire continents from my searches when looking for a new project. So hard to wade through everything. So easy to fake. The prices are low, supplies high, and lots of drooling fans. Entire villages exist on Frankenstein Japanese watches. Cheers. What else is fake, though? you're on to me....was in a mood. If you think this is bad, try finding an untouched speedmaster, must be one of the most Franken type watches out there!!!! Rick, its unfortunate but in many respects these assembly line jobs have become the eBay way. There are so many aftermarket and replica parts especially dials that you almost never know if you are going to get what's advertised. Our forum has a tremendous amount of great info available for the buyer and you must do your due diligence before purchasing. Always keep an eye out for where the watch is coming from.These people/countries can sell great items too but often junk mills come from China, the Philippines, India, Mexico, Brazil and more. There are great sellers everywhere, dont misunderstand my warning but many, many people looking to take advantage of the newbie or careless buyer do come from these countries. Become a student of the watches you love, learn all you can about the ones you want and ask questions of people here and on other forums. You can't go wrong buying from a reputable seller. Get feedback and talk to people who have done business with the seller of the watch you want. Its up to you how quick you part with your $$. Also be aware of the limitations of help and protection from PayPal and similar companys. Often there may be no protection if you pay and receive nothing in return. Read their fine print, its important ! Welcome to all new members, great to have you here ! Back in the 70's I was a welder for Westinghouse in So. California. High up on the wall of the main work area was a huge banner that read : Why is it there is NEVER enough time to do a job right, but ALWAYS enough time to do it over ? i vote fake too. sorry.